If the flooring is smooth or can be smoothed with ease, consider putting your new floor down right on top of it. Some types of hardwood and laminate can be laid right on top of the old flooring with no issues. Even if the flooring is a mess, you may be able to pour self leveling concrete or install plywood over the flooring to smooth the surface so that you can install the new flooring without having to tackle the project that pulling up old flooring often entails. This may add height, however. Asbestos was commonly used in linoleum and flooring adhesives before and during the 1970s. 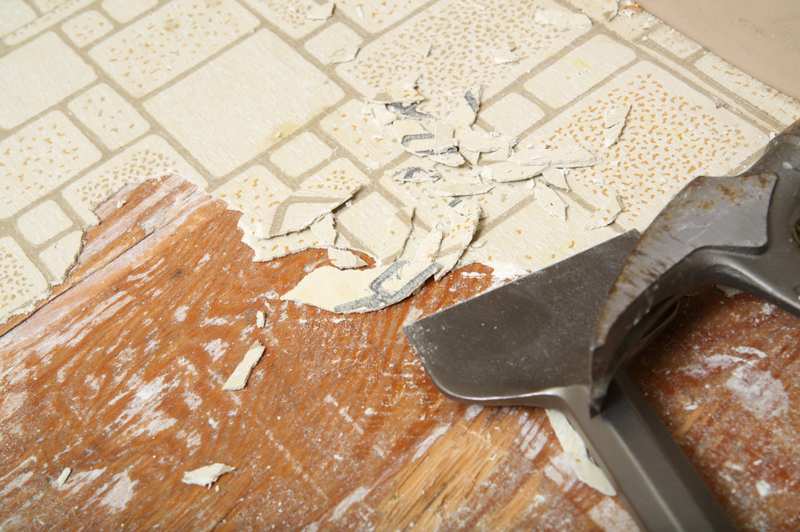 Before digging into the old linoleum, be sure to have it tested for asbestos. If it tests positive, have professionals remove it so that you and your family are not at risk for health issues from the project. If it is asbestos free, you may be able to do it yourself safely. When removing linoleum or vinyl, it is best to remember that the flooring is really two layers. Removing the two layers separately may speed up the process and reduce frustration. The top layer is generally pretty easy to remove and may be further simplified by cutting it into sections with a utility knife. When it is time to start peeling off the topper, use a heat gun to soften the flooring up as you go. The hardest part of removing linoleum and vinyl is removing the adhesive. Unfortunately, this step is necessary because the adhesive may be hard to smooth without removing and leftover adhesive may have chemicals that will cause a reaction with new flooring. The underlayment and adhesive will usually come up together. When removing adhesive, you may be able to use a wallpaper steamer or boiling water to speed the job up if the subfloor is replaceable or durable. Otherwise, a heat gun and putty knife will do the job slowly but surely. For tips about what flooring to replace linoleum with, call Flooring Headquarters at 407-262-7979.